Live your Life your way! : Life Lessons from the "M.A.D", yet spiritual, Kishoreda! Don’t ever try to live your Life trying to satisfy others and, in the process, live with your dreams and aspirations being left unfulfilled. This does not mean you must not serve others. Of course you must. But when you serve others and think you are making a sacrifice, you are really saying, you don’t want to be doing this, but are having to do this. This is where grief comes in. And where there is grief, how can there be joy? So, either you serve others selflessly or you just don’t do anything other than focusing on yourself. Either way, Live Life your way and be happy doing it! Today is legendary Bollywood singer Kishore Kumar’s birthday (he passed away in 1987, at 58). He was one person who lived his Life fully, on his own terms, often being called ‘loony’ and ‘weird’ by people that knew him, but he enjoyed every bit of his Life! Further, his sense of enjoyment created his art, invaluable, priceless gems in Indian cinema music. It’s hard to imagine Kishoreda to have delivered the kind of songs he sang without being every bit of the unpredictable yet extremely humane person that he was. Kishore Kumar: Then, there was this interior decorator – a suited, booted fellow who came to see me in a three-piece woollen Saville Row suit in the thick of summer and began to lecture me about aesthetics, design, visual sense and all that. After listening to him for about half an hour and trying to figure out what he was saying through his peculiar American accent, I told him that I wanted something very simple for my living room. Just water – several feet deep – and little boats floating around, instead of large sofas. I told him that the centre-piece should be anchored down so that the tea service could be placed on it and all of us could row up to it in our boats and take sips from our cups. But the boats should be properly balanced, I said, otherwise we might whizz past each other and conversation would be difficult. He looked a bit alarmed but that alarm gave way to sheer horror when I began to describe the wall decor. I told him that I wanted live crows hanging from the walls instead of paintings – since I liked nature so much. And, instead of fans, we could have monkeys farting from the ceiling. That’s when he slowly backed out from the room with a strange look in his eyes. The last I saw of him was him running out of the front gate, at a pace that would have put an electric train to shame. What’s crazy about having a living room like that, you tell me? If he can wear a woollen, three-piece suit in the height of summer, why can’t I hang live crows on my walls? Imagine in 1985, when information was much less easily available and people were a lot more conservative in India, Kishoreda’s ability to do what he wanted, giving a damn about what people thought, had, among many other things, a huge spiritual dimension to it. He was at peace with himself. And that’s perhaps why he was able to deliver such outstanding, soulful, masterpieces. That too from someone who had no formal training in music, who came to Mumbai only because he wanted to see his superstar brother Ashok Kumar and to meet his idol, the singer K.L.Saigal just once! Our learning: Live your Life your way. That’s when Life’s way for you will be born! Author AVIS ViswanathanPosted on August 4, 2015 March 14, 2016 Categories Art of Living, http://schemas.google.com/blogger/2008/kind#post, Ilustrated Weekly of India, Inner Peace, Intelligent Living, Pritish NandyLeave a comment on Live your Life your way! 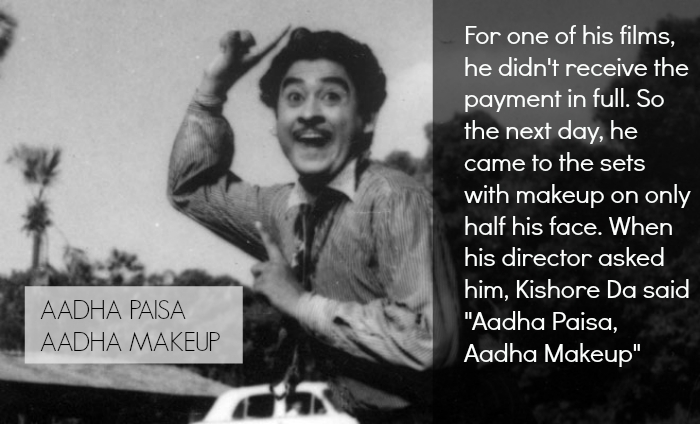 : Life Lessons from the "M.A.D", yet spiritual, Kishoreda!